More than half of all adults over 30 have gum disease. These findings were from a study conducted by the Centers for Disease Control and Prevention. Adults are not the only group impacted by gum disease. In fact, new research has uncovered a startling link between childhood who are obesity and gum disease. A study published in Diabetes Care found that just under 99% of children who were classified as obese had some degree of gum disease or inflammation. A separate group of children classified as overweight were also studied. In this group, 85% of children had some degree of gum disease. This study is among the first of its kind examining the link between childhood obesity and gum disease. However these results are similar to a range of findings in past studies covering adults. Gum disease can be challenging to identify at first because you might not even know your child has it. Mild types of gum disease, such as gingivitis, can sometimes go unnoticed. Without proper treatment, gum disease and inflammation can become more severe and more difficult to treat. Early detection and prevention are the keys to a healthy mouth. Gum disease can lead to bad breath and swollen or bloody gums. In its most advanced stages, gum disease can lead to tooth loss as the infected gums recede. 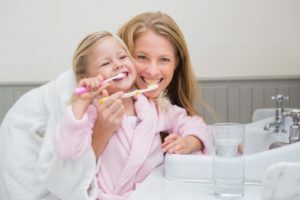 The most important step you can take is to maintain an active role in ensuring your child practices proper oral hygiene. Make sure they are brushing their teeth for two minutes twice each day. Flossing is essential to keeping gums healthy. Anti-bacterial mouthwashes are also an option for extra protection against plaque buildup. If your child is overweight, consult your pediatrician. Keep up with regular visits to our office. Our team is trained in identifying gum inflammation. We can help your child stay on track for maintaining optimal oral health. While this particular study is one of the first of its kind, it does mimic the extensive research correlating obesity and gum disease in adults. These alarming findings underscore the importance of maintaining healthy habits and keeping up with oral hygiene. For more information on keeping your child’s mouth healthy or to schedule a visit, please contact us. ← Dentist in Merrillville | Biting Off More than You Can Chew?